Earlier this summer, science had another shining moment of “discovering” something many of us have known for a long time – horses talk to us! I don’t mean to be flippant about science – I really like science! But animal emotions, cognition, and their relationships with us are areas for which science has long had a blind spot. Rather than “discoveries” these really should just be handled as “proof” of what animal lovers have known (but been told they “can’t know”) probably for as long as we’ve had relationships with animals! The main findings of the study is that horses attempt to communicate with humans – and that they cease those attempts if they are ignored for too long. No one is a better example of both of these points that our Coffee! First, a recap of the Coffee that I first met. He was a very polite boy, to the point of being an automaton. There was no attempt to interact with the humans, outside of just obeying what was asked of him. There was no reaction when they approached. By contrast, when turned out with other horses, he was a real character! He was the kid on the playground who would pester you until you chased him away. Coffee has become one of the most “talkative” horses we’ve known! A little background: our hay supplier recently stopped selling retail. Needing hay immediately, we went to a local feed store to get enough to tide us over. Unfortunately, they were out of alfalfa, so we got some grass hay. We have a bit of alfalfa from our last load, but since that is all Nash can eat, we’ve reserved it for him. The horses had a snack of grass hay this afternoon, and tonight I was doling it out for dinner. I took flakes to Tally and Coffee, and they began to eat. Wanting them to have just a bit more, I went back for a little extra. Coffee: Okay, where is the real hay? Oh, that must be it! Good! I tossed the extra piece in his stall, and he happily headed for it. I turned back to get hay for Noble and Java. I tossed it in their empty stalls, and turned to see Coffee once again staring alertly in my direction. Coffee: Okay, enough with the joke. Where is the real hay? I had to get carrots, which were opposite Coffee’s stall. He kept his eye on me. Coffee: I’m serious! Why haven’t you brought my real dinner? Me: I’m sorry, Coffee, but that’s what we’ve got. Would you like a carrot? I turned to get more carrots, and when I turned around his eyes were still on me. Coffee: Really? Is that all you can do?! I’m starving over here! Me: Oh, all right … just a minute! I walked into the dark and out to the trailer, where I knew there was a sliver of alfalfa laying on the remains of the bale. I turned around to see Coffee’s bright face shining from the barn. Coffee: Good girl! That’s right, bring that over here! That’s the good stuff! As I reached his stall, he took a step back, eyes still focused on the piece of hay in my hand. Coffee: That’s right, drop it right down there! As I dropped the hay, his nose went straight down and he dug right in. We brought the last two boys in, and finished up in the barn. As we approached the front, to turn off the lights, Coffee looked up. His nose stretched briefly toward us, alfalfa dribbling from his lips. And with that, he went back to happily munching his “good hay”. You’re welcome, you spoiled horse, you! Be sure to listen to your horses … well, maybe not all of the time! 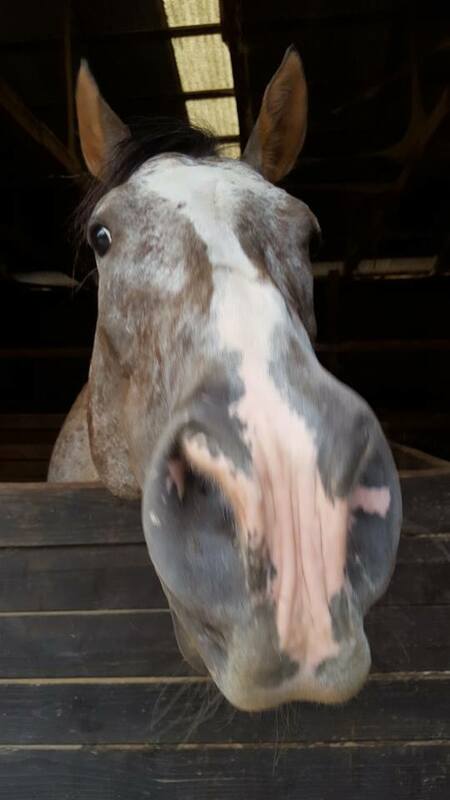 This entry was posted in Just For Fun, My Journey and tagged animal language, Coffee, communication, cross species communication, feeding time, horse talk. Bookmark the permalink.